This is really long; I apologize. What started as a write-up for the second game in the #GameAWeek challenge that I’m doing with awesome Ana Salter, Melissa Peterson, and Dennis Ramirez (and soon Nick Lalone!) has turned into a monster of a post as I try to cobble together my memory for this card game I’ve been developing off and on for about 9 months now (yes, I know I cheated!). Anyway, go read their reflections about their second games! Ana’s chilling My Town, Melissa’s clever merging of the crafting genre with the one room genre Solution, and Dennis’s retro-adventure game Time Enough to Travel. They’re also much better at writing reflections on each others’ work, sorry. It all started with Eclipse. 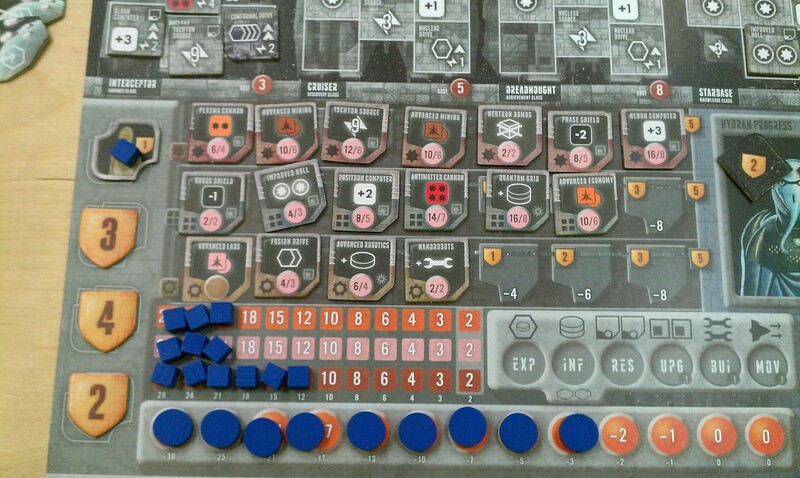 A year and a half ago, a friend of mine invited me and some others over to play Eclipse, a great space 4X game that’s also highly rated on BoardGameGeek.com. I think he had just gotten the expansion pack for it and wanted to try it out. The problem is that it takes 2-3 hours to play. We had to block out a whole afternoon for this, and doing so meant that it took us a good month or so just to schedule the damn thing, given how some of us didn’t work normal work week hours and how some of us had newborns and toddlers to manage. 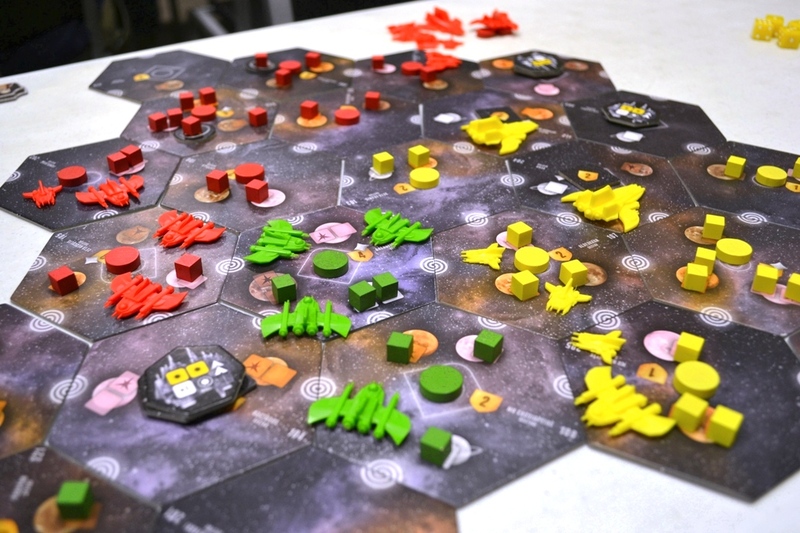 Eclipse is a relatively new game that brings Eurogame mechanics to a traditionally Ameritrash genre, exemplified by the classic game Twilight Imperium (in its third iteration now, thus abbreviated to TI3). 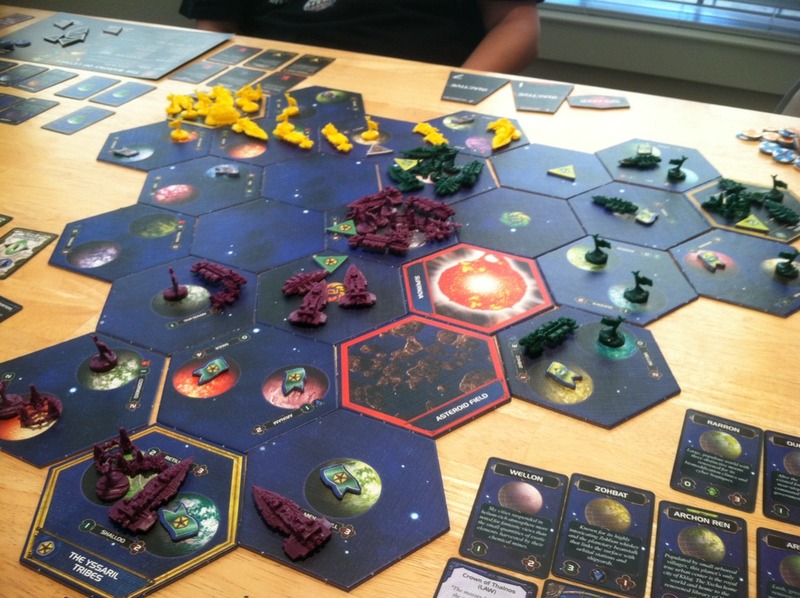 Twilight Imperium is one of those games that takes about 8 hours to play. It’s one of those games that I would have eaten up in high school when, let’s face it, my friends and I had whole weekends to kill since we grew up before the crazy busy schedules middle-class kids experience these days. But since high school (and maybe some of college), I think we’d simultaneously have a whole day free maybe only once a year or two. So along comes Eclipse which promises to give the same sort of experience in about 2 hours! And it does it while refreshing the genre with tough pro-con decisions that rely on resource management (i.e., arranging cubes on designated spots on a board) that we’ve grown to love in heavy Euro games like Puerto Rico, Power Grid, or Le Havre. But then we played it. And we ran out of time, forced to cut the game short. And this happened a couple more times. It’s clear that 2 hours is an estimate aimed at people without young kids to manage or with the tendency to arrive and then suggest we figure out lunch and eat before we play. It is a very good game, yes, and I enjoyed it quite a bit, but it was still too long to be able to bring to the table regularly. Eclipse is a game about pushing cubes around a player board (among other things). So… I set about trying to make a space 4X game that only took 45 minutes to play. I spent quite a bit of time thinking about TI3 and why it takes so long, and I decided that each player turn (or round or phase or whatever term the game uses) could take a while since there were so many possible actions to take. Eclipse streamlines this a bit by only allowing one action per turn and presenting those possible actions with some good graphic design. It also makes it costly to keep taking turns, penalizing expanding too rapidly and encouraging ending the current round (or phase or turn or whatever term the game uses). But even so, on any given turn, players still have most of the action options available to them. In thinking about some newer, speedier games in recent years, I immediately went to card games and specifically thought of Dominion and other card-drafting games that initially put very tight constraints on what players can do on their turn (depending on their card draws, starting with a very limited deck of cards to draw from). 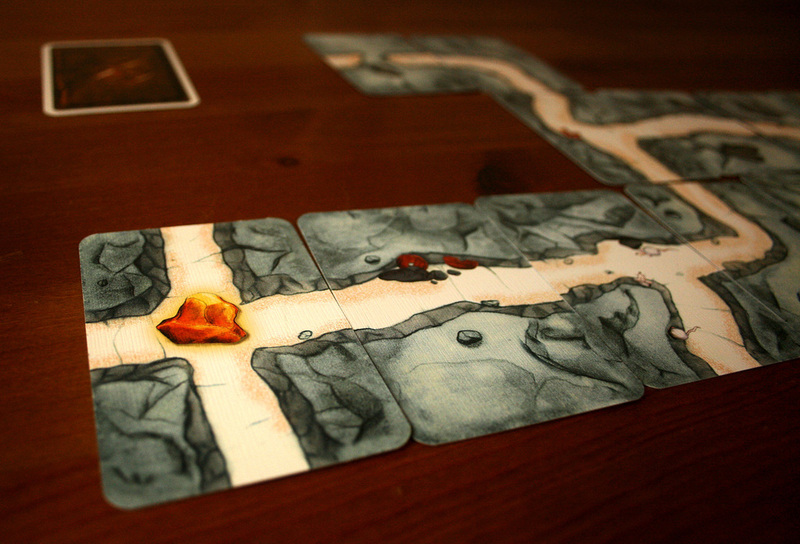 Each turn could last just seconds, keeping players’ engagement level up with very little downtime. I had also recently played Mage Knight (the Vlaada Chvátil board game, not the Clix miniatures game), which uses a card-drafting system for hero movement and actions on a hex-based fantasy map. What if I did the same thing ported over to a space theme, restricting possible player actions by whatever is in their hand and including things like move, explore (flip a space tile over), settle colonies, etc. as the card actions? 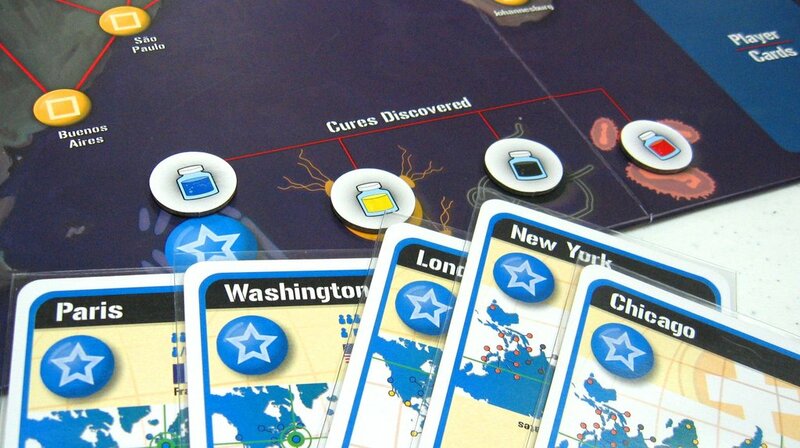 Pandemic, finding the cure is a matter of discarding sets of cards. Players play bumbling humans on the eve of discovering jump drives for space travel. Upon this discovery, however, an alien menace takes notice and sends an invasion fleet from the far reaches of the galaxy. Luckily and purely by accident, through the initial test of the jump drives, the first explored world was the site of an alien artifact that could possibly hold the key for survival. Players then have to flee from their alien conquerors while simultaneously piecing together the meaning behind their alien artifact discovery. 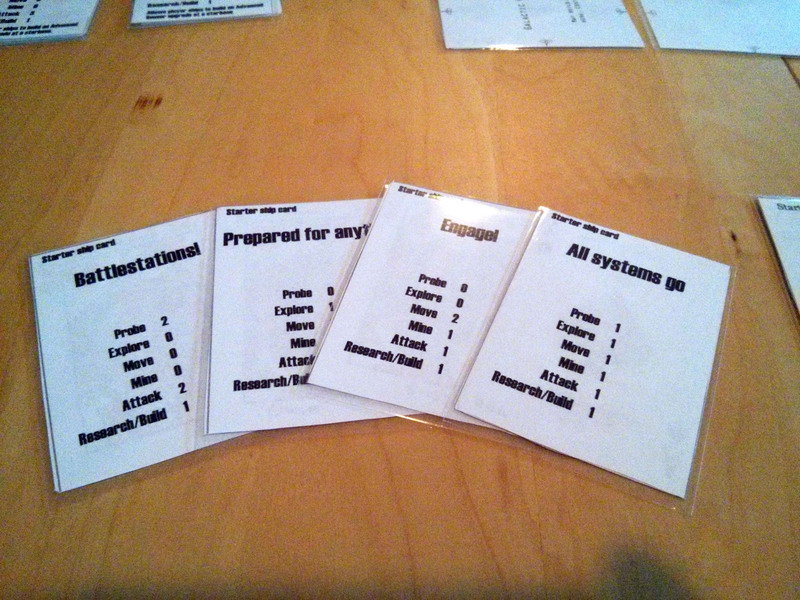 So then, in the space 4X co-op card game, the player deck would include Move cards, Explore cards, Combat cards, etc. and one of the actions players could do is trade cards with each other as well as discard cards to draft more powerful cards into their decks (i.e., conduct research). Each turn, players had to choose just one (maybe two) actions to take, and they could only do whatever their cards allowed. Originally, the game was designed with a similar form factor to TI3 and Eclipse. Space tiles were big hexes that players flip over and attached to a growing map of the galaxy just like in Eclipse. But once I started playing with the card decks, it seemed a logical step to make the space tiles also cards (like in the game Saboteur), so that the whole game could be all card-based and very compact. And then once I decided to make it all card based, it seemed logical to use transparent cards (like in the game Gloom) to represent player ships and alien threats on the board. They would just be overlayed on top of the space cards. That was the second version of the game. The third version of the game that I created last summer came about during the Reed Summer Game Jam after playing Arctic Scavengers (AS), another card-drafting game that came out around the same time as Dominion and that I actually enjoy more since it features a tidy player combat phase at the end of each round (similar to City of Remnants, i.e., the game with *all* the mechanics in it). I liked how in AS each card could be used for multiple types of actions and part of the tough decision came from deciding which action to spend the card on. The problem with how the space 4X co-op card game was working before was that it sometimes seemed too simple in what actions you could do with such basic one-action cards. 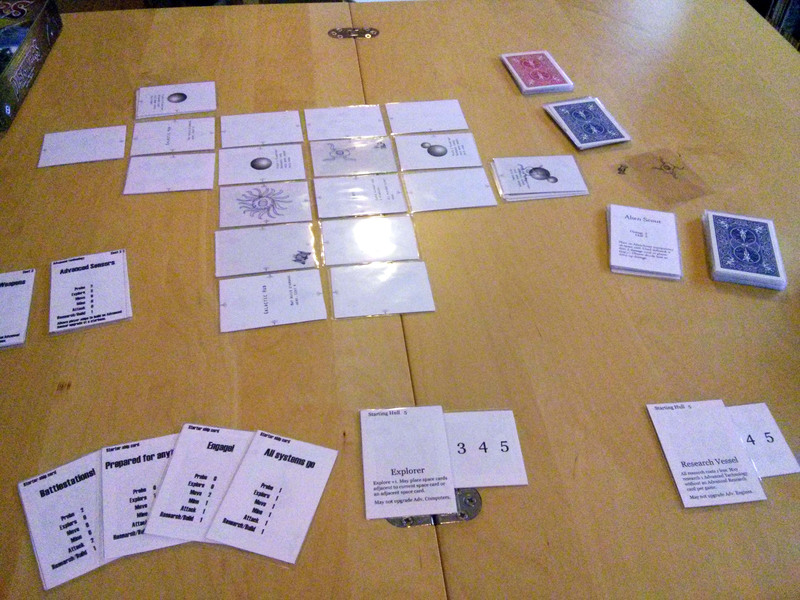 Space 4X Co-op Card Game version 3 with Arctic Scavengers inspired player cards. After playtesting this new AS-inspired version with some game folks at U Toronto in late August, I removed the move action as a card-based action and just let players move 2 space tiles any time they wanted as one action (and they could perform two actions on their turn). This was Version 3.5. For this past week’s #GameAWeek challenge, I decided to cheat and resurrect this space 4X co-op card game and give it another round of revisions. I’m clearly not following the “don’t work on things that you’ve worked on previously” clause of the challenge, but I’m making the challenge work for me, and this game really needed some loving. 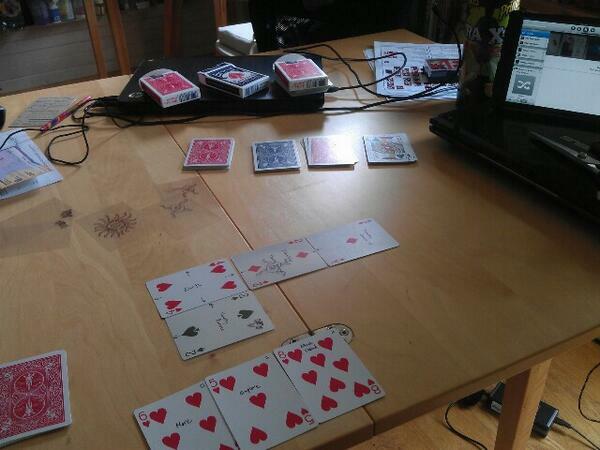 *My* space 4X co-op card game has always been a bit too fiddly, and drags on longer than I want. As a card game, I want it to last about 30 minutes! With regard to the game length, the problem I think is that the win condition is too hard to come by in a timely manner. Each planet on the space map can be mined or exploited for resources, which is basically a random Planetary Resource card that gets added to a player’s deck. These cards allow (1) the research of advanced technologies, (2) the research of alien artifacts, (3) or the actual alien artifact (as an inert card that just takes up room diluting a player’s deck). To win the game, four of these alien artifacts must be researched, which means a player must have at least one alien research card along with alien artifacts that they’ve picked up during the game and then randomly cycle through their deck often enough so that both types of cards appear in a single hand. It was taking forever for this to happen, but it was also inevitable that it would happen. I had intended for there to be an Alien Threat Track (loosely based on the horror track from Arkham Horror and the turn tracker in Agents of Smersh, and something I’m absolutely sure I want now that I’ve played Eldritch Horror a couple of times) added that was advanced every round, thereby limiting the number of actions players had before the end of the game, but even if the game had this, there was very little players could actually do to mitigate the randomness of their deck cycles. (3) I decided to have three classes of planets, each would have one of the types of Planetary Resource cards, rather than have the Planetary Resource be a random one. This way players can purposefully divide up their labor and have one player go after the alien research ability while other players gather the actual artifacts. Now that I think about it, however, I think there may still be a deck cycling problem even if it is now easier to purposefully and strategically determine what’s in a particular player’s deck. Maybe I could go back to Version 1 when players had to discard combinations of other cards to do the research action (rather than a specific alien research card). I’ll have to save this for yet another revision in the future. I’m not sure the direction for the art, though. Part of me wants to keep it really serious, alien horror themed, but another part of me wants to make it light with Tom Wham sort of art. One thing I am absolutely sure about is that my experiences as an avid tabletop game player had an effect on my design decisions, making me very suspicious of board games I see on Kickstarter where it’s pretty clear the designers aren’t really board gamers. My game wouldn’t be the game it is today without Pandemic, Arkham Horror, Eldritch Horror, Saboteur, Bang!, Arctic Scavengers, Mage Knight, City of Remnants, and, especially, Twilight Imperium 3 and Eclipse. That sounds totally boss. I’ve only seen one game that’s even kind of similar, Vanished Planet. Thanks Benj! 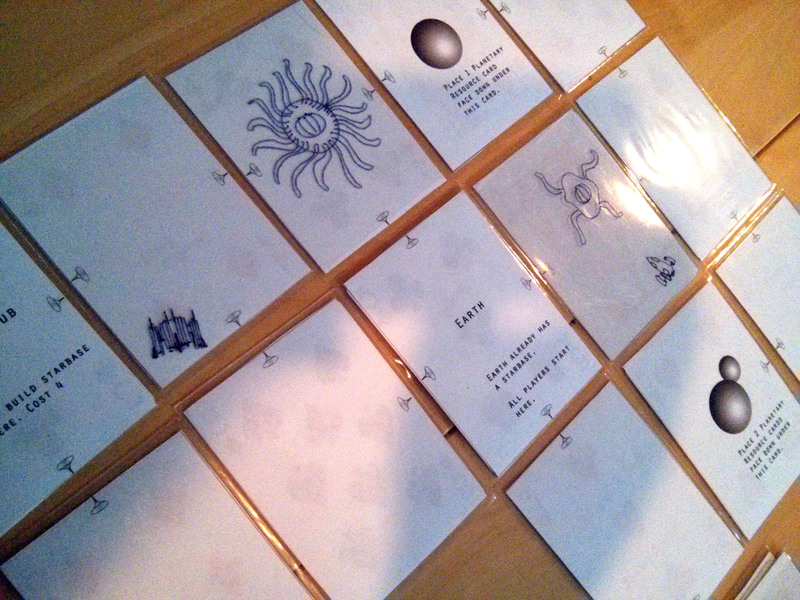 It’s only gotten a few playtests, so please let me know if you play it!